We just wanted to tell you how Gordon, our adopted Golden Retriever is doing. We got him last July and our family will never be the same!!! Right from the start he made himself at home and made friends not only with us and our neighbors, but with every dog in the neighborhood! He is very loving, gentle, patient, playful and funny. We take him on walks and he plays with the other dogs almost every day. He has recovered from his hot spots and he now has a beautiful full coat. We couldn't have been more lucky with the dog we got! We love him and he loves everybody! Thank you so much for finding Gordon for us! It has been a long time since we have spoke. I apologize, life seems to have gotten in the way. I wanted to write you to let you know that Gordon, our beloved golden passed away on September 25th. To be completely honest, I&apos;ve been having difficulty with all of it and have been putting off this email. I felt that you should know but more importantly be aware that he spent 11 years a part of a family that couldn&apos;t be more appreciative. I just wanted to thank you all, you saved his life. I am not sure where he might have ended up, maybe with another family but maybe alone and in a pound. I remember the dedication you showed us, the months we waited to be matched with a dog that would fit our situation (our cat being someone who might have objected to any random dog). When we first met, we knew he was right for us and that we were right for him. I was 16 then, I am 27 now. I have been through so much and he has been through it with me at my side. I know you know this, you foster, protect and love so many of them. I just want to thank you. 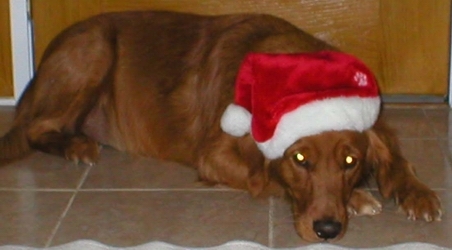 Gordon had been enjoying his later years, we had joked that his full red / golden coat had turned to cinnamon and sugar. He had slowed down but still went on walks to his favorite park regularly, played with neighborhood dogs and showed his full love towards all of us on a regular basis. When he left us it was fairly sudden, we knew he was older, we didn&apos;t want him to be in pain. He still presevered through a few weeks in late summer. He finally lost his appetite and seemed to be lethargic. It became apparent that we should allow him to leave on his own terms. Merely a few days prior to that day, our family had a pizza party with Gordon. To be completely honest with you, it was not planned, we knew he was sick but not that sick. We all came home, we sat at the dinner table. We ate and laughed. Gordon was up and begging for pizza crusts like he had done for so many years prior. We went out in the backyard. It was a late summer twilight and a beautiful night. I think Gordon knew more than we did. He was so happy. We were too. A week later, we went to the vet for the last time. Even on the ride over, his head was out my window, slobbering and blissful. We stood outside the vet for several minutes, my arm around him. I told him, "We&apos;re not going to hurt you, we love you." An older gentleman walked past and remarked, "what a beautiful dog." Even in his last hour, random people were complementing the beauty of this creature who had become my little golden brother! I held his paw, we were all there and he went peacefully and loved. I apologize for this dramatic email ha ha, I just wanted you to know how much he meant to us. He was not a "pet" or simply "a dog," he was our family member. You do a wonderful job, and we are all thankful that you helped us find Gordon. I assure you, he lived a wonderful life. I wish he was still here. When I come home to my parents house, I usually look around to see if he is sprawled out in the sun, wagging his tail to welcome me back but then I remember he is no longer here. One thought that gives me peace is knowing that your organization is out finding homes for hundreds of Gordons. I wish you all the best. You should be receiving a letter (or letters) from my family soon. All the best.